Connect the Dots began in 2014 with a mission to connect individuals and communities through the creative arts, working with young women (Girls to the Front), migrant women (Make Do), older people (Make Moments) and across generations (Mind the Gap). The commonalities across these programmes were the use of the visual arts as a prompt, a form of expression, a tool for creative thinking; and the space for exploration, growth and connection, both to each other, to our communities and to ourselves. From 2017, Connect the Dots has become more concise in our audience stemming from a desire not to replicate programmes but instead to work alongside those underrepresented in the arts. For us this is older people and people living well with dementia, their families and carers. You can find out more about our past projects by clicking on a dot. Creative arts workshops that focussed on building confidence and leadership capabilities in girls aged 10-14. Intergenerational creative arts workshops that aimed to encourage cross-societal conversations and relationships, bringing women across generations together. Workshops that provided art-making opportunities, cultural exchange, and connections, for people of migrant and refugee backgrounds. "Women, particularly young women, should have all the opportunities they can to show society (particularly men), their skills, talents, abilities, and personalities. to what they can achieve or contribute to society." 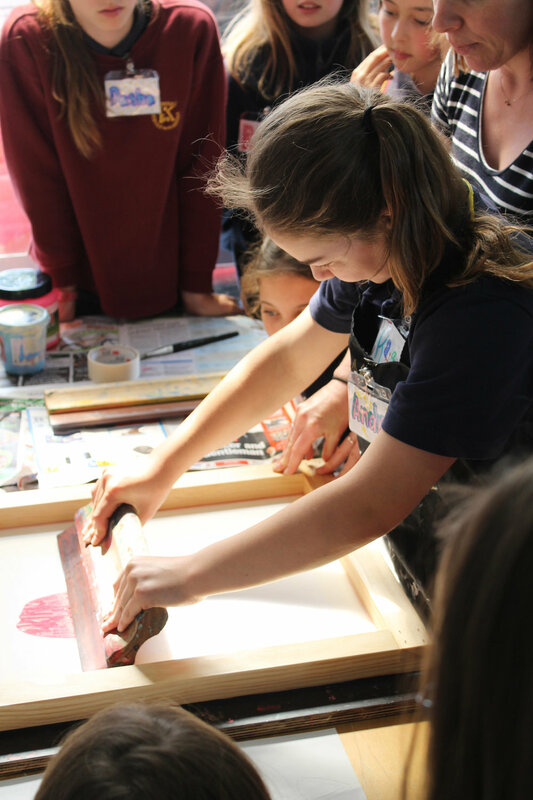 In these free workshops for girls aged 10-14, we explore issues by experimenting with a range of creative techniques and processes facilitated by professional artists. Through a process of conversation, self-reflection, debate, and thinking through making, Girls to the Front culminates in an interactive, participatory event or exhibition curated by the girls to expose the creative process and their personal development. "Normally when you do art at school you don't get to describe it, you just get to draw it." The themes and workshops are designed to develop the girls team work skills, leadership skills, and build confidence. Art is a tool which we believe can provide transformational opportunities for these young women. Art can enable this age group to build their own identity separate from their peers and their family, and foster a sense of self. You can also watch Andrea Gaskin and Selina Anderson, founders of Connect the Dots Charitable Trust, talk about Girls to the Front, which encourages leadership and confidence through the creative arts for girls aged 10-14 years old. Mind the Gap is an intergenerational creative arts programme that brings together 15-18 year old young women, and elderly people from the local community. This programme encourages conversations and relationships that are cross-societal, across generations, and across backgrounds. Through this we believe participants will feel more connections with their community, with themselves and who they are. Using art making as a tool for exploration, participants will explore their personal identity, social identity, and their place in the wider community. Make/Do is an applied arts project that aims to create a space for cultural exchange and connections. Developed to provide art-making opportunities for people of migrant and refugee backgrounds, Make/Do is a series of textile arts workshops that both acknowledges the cultural traditions of its participants, as well as introduces them to Maori, Pacifica and European art-making techniques and traditions. Connect the Dots believe art is a tool to bring communities together to share skills and make connections. As well as exploring textile art techniques, such as silkscreen printing, embroidery, tivaevae and weaving, Make/Do also introduces activities that support literacy development, thereby giving participants the opportunity to gain knowledge and reduce their social isolation.